Item # 312322 Stash Points: 695 (?) This is the number of points you get in The Zumiez Stash for purchasing this item. Stash points are redeemable for exclusive rewards only available to Zumiez Stash members. To redeem your points check out the rewards catalog on thestash.zumiez.com. Add a fun accessory to your backpack, purse, or luggage with the Life Is Strange Hotel Key Chain from A-Lab. 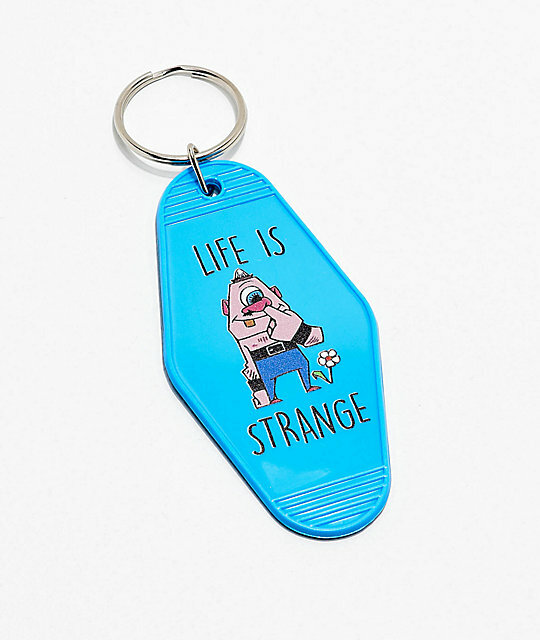 This hotel style key chain features a blue plastic construction with a graphic of a Cyclops monster accompanied by text that reads "life is strange," creating a design that it is sure to put a smile on your face. Life Is Strange Hotel Key Chain from A-Lab. Blue plastic hotel key chain with silver ring attached. Graphic of a Cyclops with text that reads "Life is strange." 3.5" (9cm) tall by 1.75" (4cm) wide. For use on bags, backpacks, purses etc.